St. Mary’s University announced a new strategic plan to reshape the education that undergraduate, graduate and certificate students across the campus receive in the arts, humanities and social sciences. The plan will turn the School of Humanities and Social Sciences into the College of Arts, Humanities and Social Sciences. Students walk near College of Arts, Humanities and Social Sciences buildings at St. Mary's University in San Antonio, Texas. St. Mary's is the oldest Catholic university in the Southwest. This latest evolution of our approach to the arts, humanities and social sciences stems from our longstanding commitment to the liberal arts — rooted in Catholic tradition — as the primary tool through which we help our students create lives as transformational leaders. St. Mary’s University announced today a new strategic plan to reshape the education that undergraduate, graduate and certificate students across the campus receive from the beginning in the arts, humanities and social sciences. The plan, drawing on the latest in educational research, increases emphasis on high-impact educational practices intended to heighten educational experiences and expand career opportunities by thrusting students in the middle of intense learning experiences, promoting community-supportive research and embracing diversity. The plan will turn the School of Humanities and Social Sciences into the College of Arts, Humanities and Social Sciences by broadening and deepening learning in the Marianist tradition. Created after an inclusive year-long process, the plan “is intentionally designed to prepare all students and to advance our communities by engaging some of the best thinking in higher education, to ensure our students are prepared as servant leaders in the Marianist tradition, and are ready to compete ethically and effectively on a global scale,” said Christopher Frost, Ph.D., Dean of the College. The College encompasses 27 undergraduate majors, 11 master’s and doctoral programs, as well as minors and certificate programs. The College, which includes nearly 1,200 students, is significantly larger than the other three Schools. This breadth and depth of offerings and the primary role in delivering the St. Mary’s University Core Curriculum, led the University to conclude it more appropriately fits the structure of a College than a School. To build on those offerings, the College’s new strategic plan is “placing much greater emphasis on study abroad, undergraduate research, internships, interdisciplinary seminars, service learning — means to intensify the educational experience, personalize it to student needs and interests, and connect to the global challenge,” said Frost, emphasizing that some students are writing and publishing original research as early as their first semester on campus. Watch a short video about the name change (https://www.youtube.com/watch?v=dgni9jY6B8Q) or read the full Aspirational Strategic Action Plan online (https://cloud.3dissue.net/5656/5635/6316/13518/index.html). 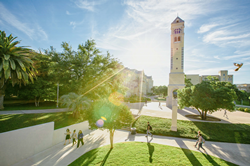 About St. Mary's University: St. Mary’s University, founded in 1852, is the first institution of higher learning in San Antonio and the oldest Catholic university in the Southwest. It offers 75 programs, including doctoral and law programs, and has a diverse student population of about 3,650 of all faiths and backgrounds. Its vision, as a Catholic and Marianist liberal arts institution, is to become one of the finest private universities in the region, a gateway for graduates to professional lives as ethical leaders in Texas, the nation and the world.